The most common dimensions for new home powder rooms are about 5x5 or 3x6 feet, although powder rooms can come in any shape or size. 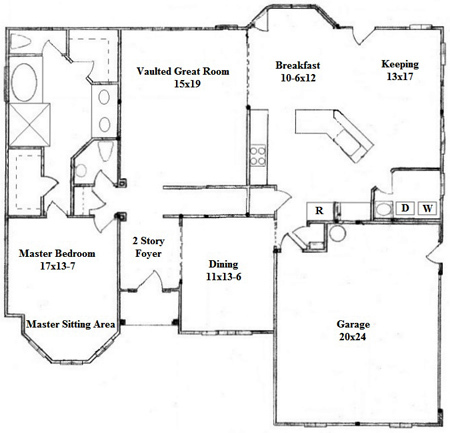 See photos and floor plan drawings of 10 powder room layouts, below. 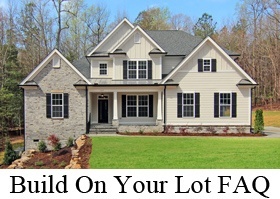 For this Raleigh custom home, Stanton Homes modified the original powder room floor plan layout to create an L-shaped room. This L-shaped powder room offers more space for storage. 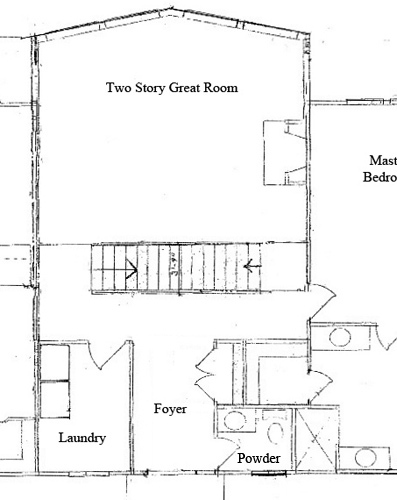 It also enables the powder room door to swing inwards, rather than out into the hallway, which would have impeded traffic flow at the bath entrance. 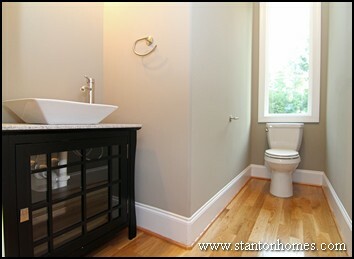 This powder room is also tucked away from the kitchen and formal dining room - a common home buyer request. 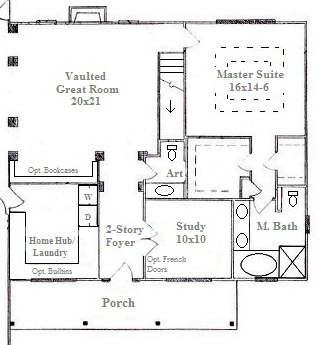 In this version of The Treehouse, the square shaped powder room is located just inside the front door. Light maple flooring and contemporary finishes - such as a white vessel sink - make this powder room feel larger than it would have with darker flooring or fewer windows. The foyer hallway then leads to a central staircase, carefully placed to block clear lines of sight from the front door through the rear wall of windows. 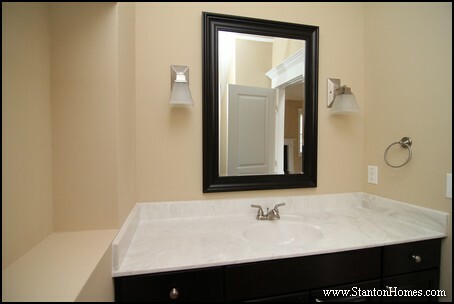 This powder room vanity is wider - also placed in a square room layout. When maintaining the square footage size in a small powder room, additional vanity storage should be weighed against open floor space and ease of maneuverability. 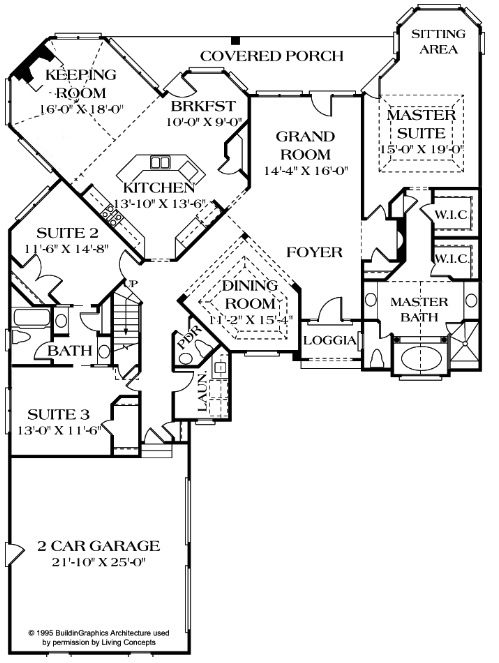 In this custom home floor plan, copyright Stanton Homes, the powder room vanity is much larger than what you typically find. The vanity includes two rows of drawers, and center cabinets. An art niche with built in spot light was placed directly inside the powder room - visible when the door is left open. A framed mirror flanked by wall sconces add simple elegance to the room. 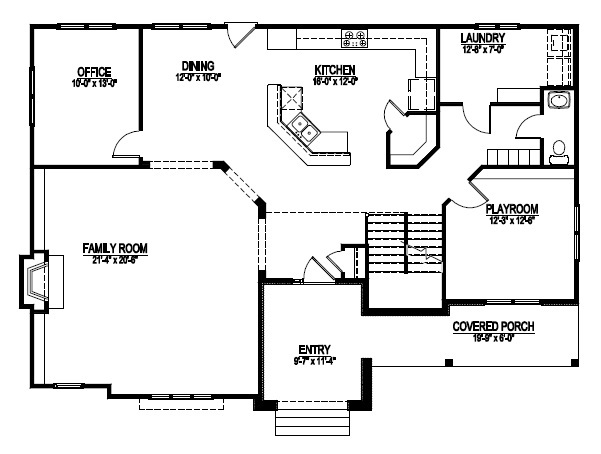 See red line drawings that show how this floor plan was modified to move the powder room out of the foyer - click here. 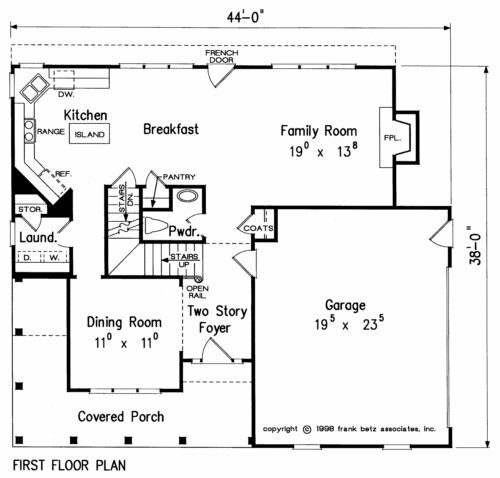 Powder rooms with angled walls or turns are often tucked into complex floor plans that feature angles throughout the home. These odd shaped powder rooms can often be the most interesting - such as the angled powder room with painted wainscot walls and a gold framed mirror pictured below. 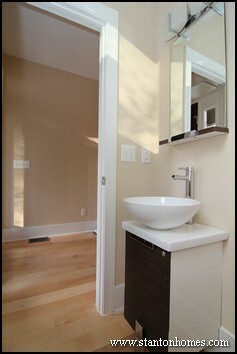 A thin pedestal sink keeps this very small powder room feeling more open. 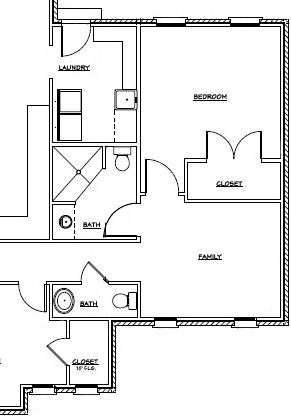 This powder room is a very small design - with the pantry closet cutting into the square footage. 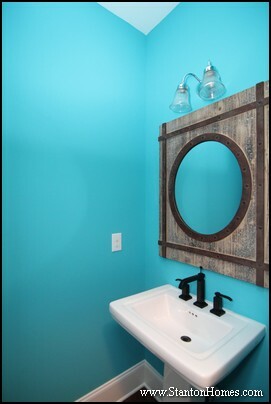 Adding metallic accents, mirrors, and windows are great ways to make a small powder room feel larger. 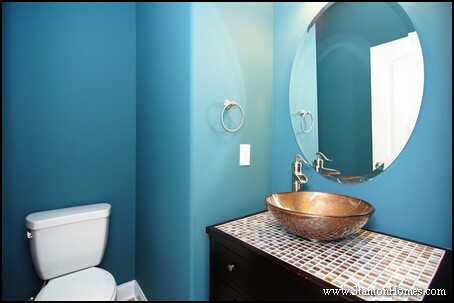 Glass tile mosaics continue to be a most requested feature in custom home powder rooms. In this Raleigh new home, tile with specs of gold perfectly match the vessel sink. 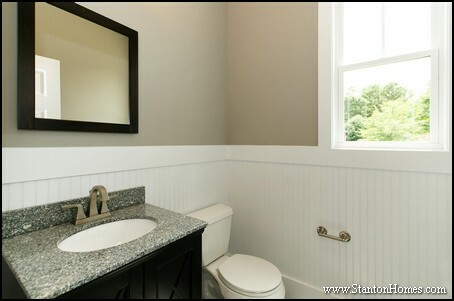 In this custom one story accessible home, even the powder room offers ease of use - with a roll-under vanity. 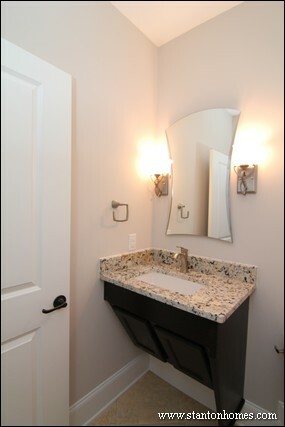 Modern design features include the curved mirror, unique wall sconces, and white square sink mounted below the granite counter top. 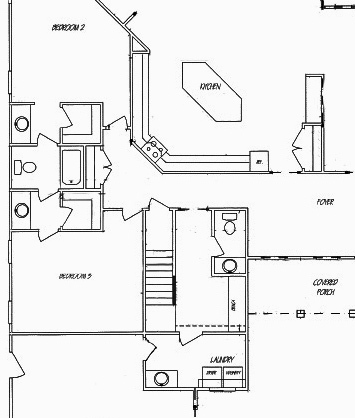 A corridor powder room is one long room, with a sink at one end and a toilet at the other. 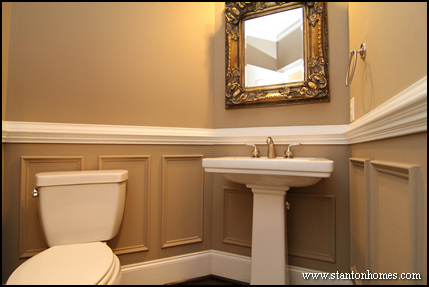 Here is another example of how to integrate an odd shaped or angled powder room - with a much more simplistic design. 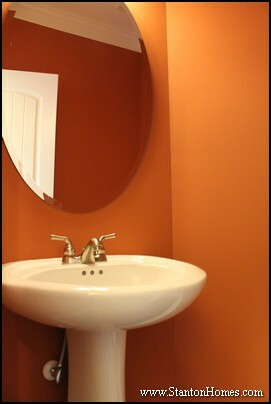 Bright colors work well in smaller spaces - which is why you will see oranges, reds, greens, and purples in many Raleigh new home powder rooms. 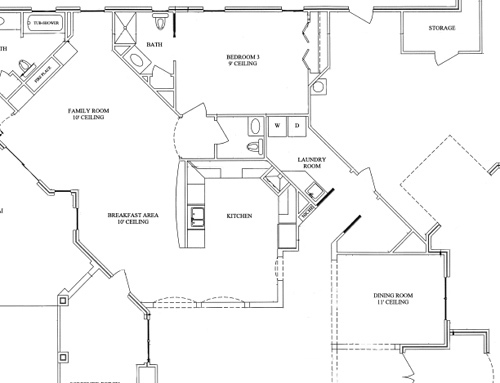 The layout of this custom home is very efficient - with the powder room tucked to one end of the home, offering privacy away from high traffic areas.